I haven't done one of these custom cards in a very long time...but a recent hockey game had me thinking about reviving the trend. 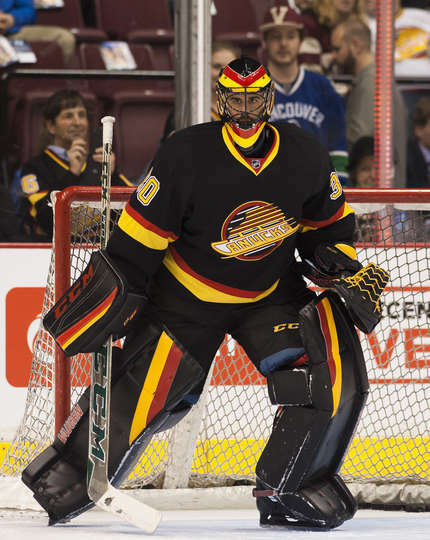 A couple weeks ago the Vancouver Canucks went "retro" by wearing their iconic skate logo jerseys for a tilt with the Toronto Maple Leafs. The Saturday night match definitely brought back fond memories of the 'Nucks and their heyday when Linden and crew went all the way to the Stanley Cup Finals in 1994. As much as I enjoyed seeing the new old threads, I thought Ryan Miller did a great job channeling his inner John Garrett. 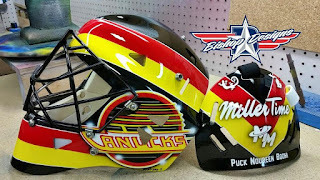 Miller's mask definitely had a throwback theme and the bold red and yellow colors really punch against the black background. It's a lid that might not have a lot of detail, but the impressiveness of it can most definitely be seen from all reaches of the arena. Painted by long-time artist Ray Bishop, the classic 'V' shape harkens back to the old-school masks of the 70's with the likes of John Garrett. 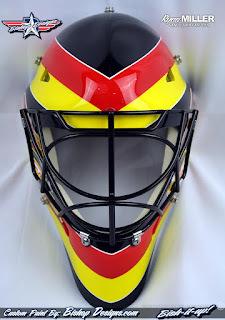 Back in a time when team colors and bold, solid shapes adorned the masks (whereas today's intricate airbrushing can take away from the beauty of the design from a distance). Garrett not only has a killer mask....but how about them jerseys!! Miller's retro mask also has a hint of 90's backstop Kirk McLean both in shape of design and era. But I like to go back to the 70's whenever I can. Who can blame me. 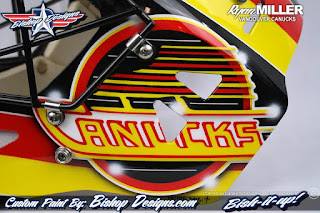 In addition to the great bold colors used by Bishop, he fired up the instantly noticeable skate logo the Canucks used in the late 80's and into the 90's...which makes for some fantastic patch cards by the way. The logo shows up of both sides of the mask giving it that symmetry which was common of the times. I really like this mask and I think more goalies should adopt the big, bold colors. While I can appreciate the intricate detail that goes into some of these designs, I can't help but think that the overly-busy canvas can take away from the fans' enjoyment of it. And I feel that more goalies do have less detail - or at least find a better balance of the two. 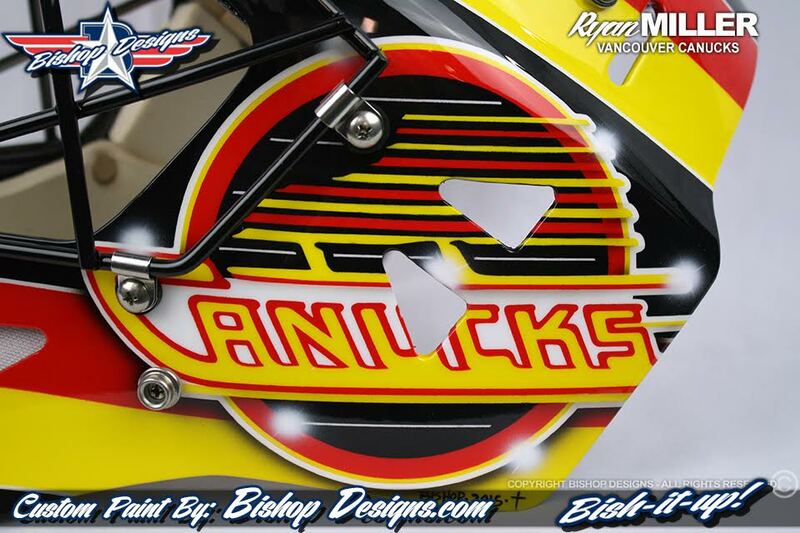 The backplate shows Ryan's always used "Miller Time" along with the names of his wife Noreen, son Bodhi and dog Puck. 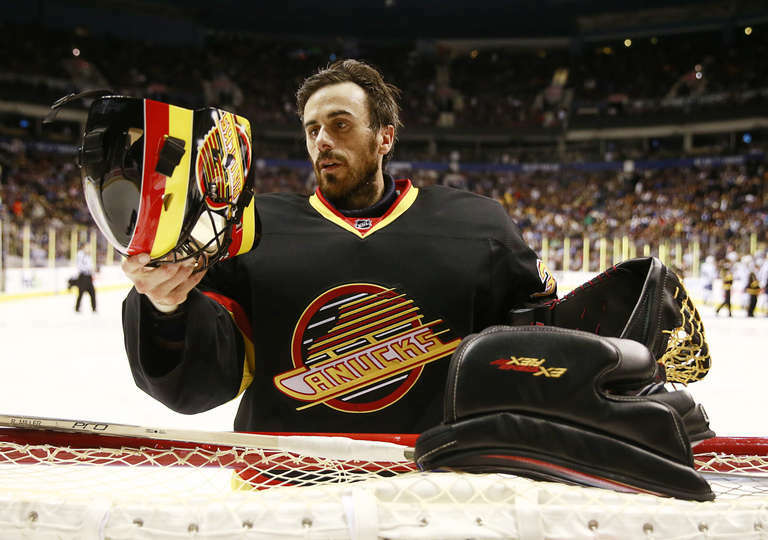 I think part of the reason why this mask works so well is because it went great with the rest of Miller's gear. 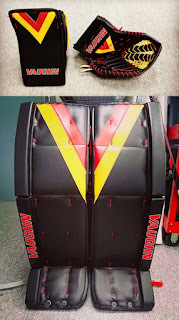 C'mon....how great do those pads look?!! And I want the blocker and catcher. You'd be the most popular guy on the street with those during weekend road hockey. Great look. I'm sure that it just makes the fivehole look even more enticing, but it's all about the look - right? It's a shame that the Canucks couldn't do more during the actual game. This season really does not harken back to their gritty, talented '94 squad that pushed themselves to a flimsy goalpost away from the Cup. At the end of the day it was great to see a slice of vintage Vancouver hockey goodness and I hope that they continue the tradition next year. I can't help but be a fan of this mask. It goes right along the lines of what John Garrett was wearing back in the early 80's. 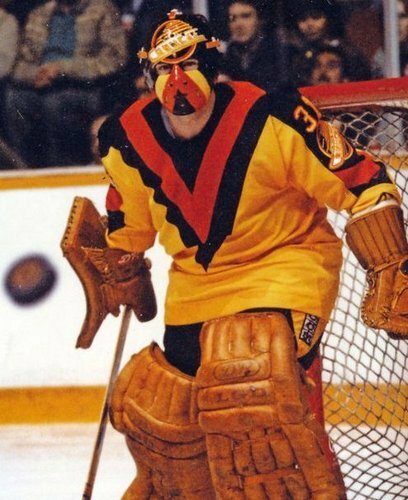 A real special time period in the history of Vancouver mask and jersey history. So now it's your turn to RATE MY MASK!! I sense some OPC like photoshopping going on... 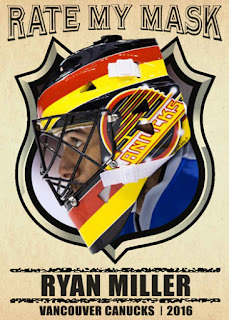 I do not remember Miller wearing that mask with his blue jersey. Nope. It's a legit photo. The only closeup shot I could find was during practice where he wore his blues. And what's with the quarter points??!!! C'mon!!! !